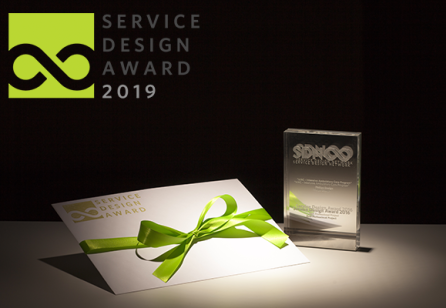 This project is the winner of the Service Design Award 2016 for Systemic and Cultural Change in the Private Sector. This case study is part of Design Thinking In-house. 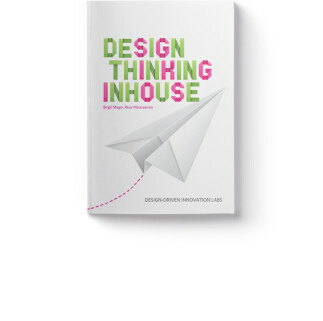 The Design Thinking In-house book is available to purchase in print and digital formats, and in English and German editions. Not a member yet? SDN members enjoy a special 15% discount. Become a SDN member, or upgrade your community membership to have access to all exclusive benefits! Deutsche Telekom is one of the world's leading integrated telecommunications companies, with some 156 million mobile customers, 29 million fixed-network lines, and more than 18 million broadband lines. We provide fixed-network/broadband, mobile communications, Internet, and IPTV products and services for consumers, and information and communication technology (ICT) solutions for business and corporate customers. So that we can continue to be successful, we are already evolving from a traditional telephone company into an entirely new kind of Service Company. Our core business, i.e., the operation and sale of networks and connections, remains the basis. But at the same time we are committing to new business areas that open up future growth opportunities for us. Our strategic goal on this journey is to be a leader in terms of customer perception, with service and network quality, and with reliable, easy-to-use products and services. Our aspiration is to provide outstanding experiences to our customers. Our business environment is undergoing changes at tremendous speed and faces increasing complexity. We find transformation in every aspect of life with an impact on our customers’ needs and expectations. We are in the middle of a paradigm shift in business: Strong competition, small margins and disruptive new players require genuine product, service and business model innovations to secure a sustainable competitive advantage. Digitalization opens new opportunities but also challenges us to be ready for consistent customer experiences – around the clock, across all channels, and with a constantly high service standard. It is all about creating real innovation and meaningful solutions that make a difference. The ICT sector is certainly not insulated from these wide-ranging changes. Rather, it is one of the key drivers. The industry is confronted with a new situation: Business paradigms and models that have dominated for decades no longer seem to work. Every day global players from other markets raise the bar in terms of customer experience and challenge the status quo. In this radical changing environment we need to see today’s and tomorrow’s challenges differently than we ever have before. For us, as a company, this means to fundamentally rethink and reorganize the way we work and approach things. Where we come from, however, is linear thinking, long-term planning, silo-organization and not-invented-here syndrome. This way of working keeps us from integrating flexibility and agility in our work. As technological and economical networking increases, conventional business thinking stands as a limiting factor. We believe that it is time to implement a new mind-set and working culture. 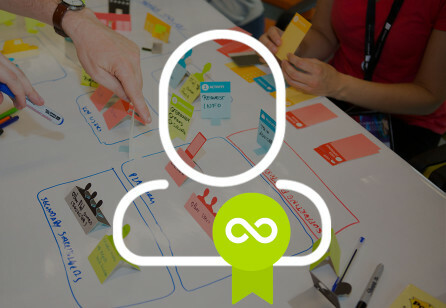 OUR MISSION: EMBEDDING USER-CENTRICITY AND AN INNOVATION-DRIVEN MINDSET IN OUR CORPORATE DNA. For that reason, we aim to transform our working culture at Deutsche Telekom: Understanding failures as opportunities to learn and improve, failing early but cheap. Focus on tangible results and user feedback at the early stage of a project, utilize rapid prototyping and continuous user feedback. Think and work in iterations. Start designing new products, services and systems with a holistic and unbiased approach. In this context we utilize design as a discipline at Deutsche Telekom to trigger various kinds of forward-thinking transformation using new processes, new mind-sets and new methods. It is not reserved to designers anymore and addresses all business units that are aiming for new and future-oriented solutions. May it be new and customer-centric products for marketing, offers from HR that are especially designed for employees or finance processes that are turned into lean financial planning. 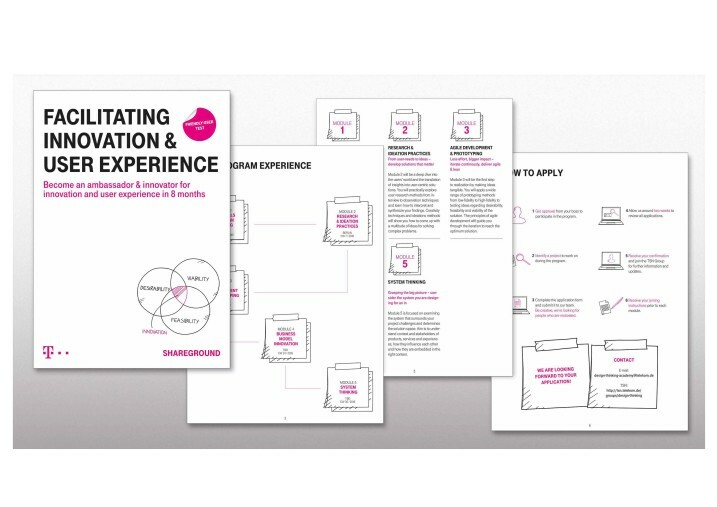 Since Deutsche Telekom is strongly committed to embedding design practices in the entire group, the HR Lab is working on its implementation systematically using a bipolar approach. This means that we are supporting both on bottom-up initiatives as well as following a top-down implementation strategy. We chose a joint approach and close cooperation with relevant units such as product design, research & development and human resource development. Inspiration at top executive level: We provide thought-provoking formats such as learning journeys for the top 200 managers. Our aspiration is to seed a respective mind-set and inspire towards change at the top executives line. Acceleration for executives and teams: We provide learning opportunities for the top executives’ leadership teams, and enable their development of project teams utilizing design methods on-the-job. We focus our group’s strategic projects from all corporate functions. Incubation at the organizational level: We train design coaches in all corporate functions and host a community of practice to seed inspiration and share knowledge across segments and functions in the entire group. Transition at the employee-level: We shape awareness via communication and enable our employees with both virtual and on-site training opportunities in order to bring design practices to daily business, making the transition happen. 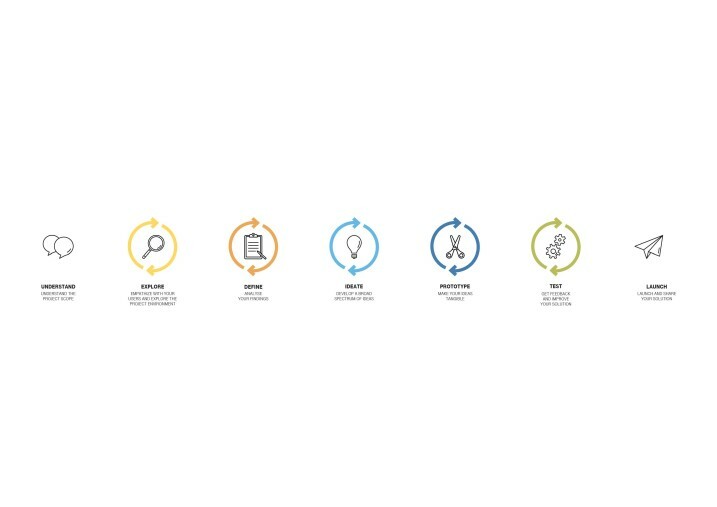 In order to make this shift towards user-centricity and an innovation-driven mindset happen, we defined seven strategic building blocks: Communication, which is about continuous communication. Enabling, which aims to train our people. Toolbox, which consists of working tools and assets. Labs, which is about facilitating business projects from all units. Community, which aims to bring our practitioners together. Network, which is about keeping the connection to science and economy. And Hub, which aims to replicate the HR Lab. We strategically put the topic on the agenda of the organization. This can mean playing it on internal media in order to get the necessary attention, creating relevance, and informing about events. Media: We focus on internal media: Employee magazines, Deutsche Telekom’s intranet, and internal social network. Beyond gaining attention and creating relevance, it is a platform that keeps people updated on the topic. An editorial plan ensures that relevant information like articles, project reports, studies, or papers are regularly shared with our internal audience to keep visibility of the subject high. 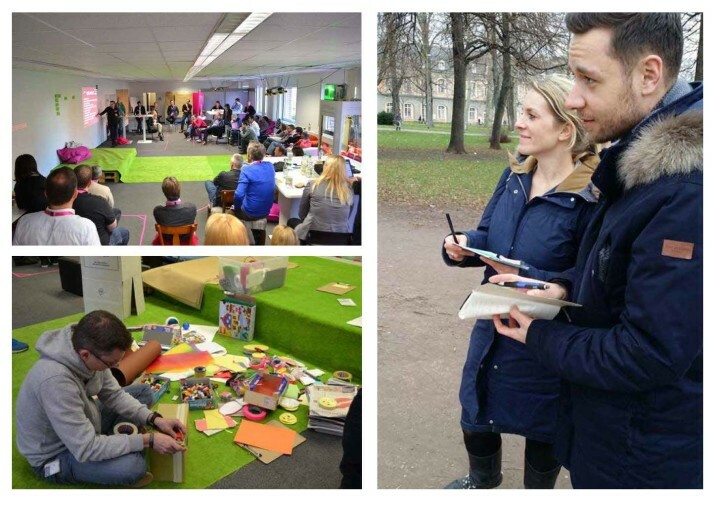 Leadership Summits: Design Methods are used in an obvious or subtle way every year at the Leadership Summit of the Top 200 managers of Telekom. 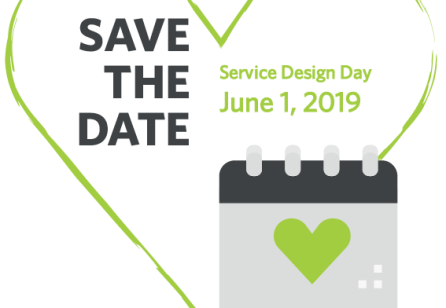 During the Summit in 2014, over 250 leaders participated in a Design Sprint exploring the question, ”How might the customer experience in 2025 look?” – based on future trends and prognoses. We developed a diversified training portfolio that is customized to the different target groups: teams, experts, leaders and top executives. The trainings vary from 120 minutes up to an 8 month-long program with 5 different modules. Teams: Awareness-Sessions and simple training modules from 120 min. up to 2 days in which the basics are taught, design tools & methods experienced, and applied to real cases. Experts: Comprehensive international training program that teaches state-of-the-art methods, as well as the essentials of Service Design, Design Thinking, Systems Thinking and trains future coaches in all corporate functions. Top Executives: Thought-provoking 2 day format, in which participants experience a Design Sprint, talk to experts in the field, but also discuss the potential and applicability across corporate functions while meeting representatives of other companies who share their experiences with the implementation of various design methods. All formats refer to one process, one toolset, consistent principles, and the same messages. Additionally, we also developed digital learning possibilities and video tutorials, that can be used time- and location-independent. Standard design process: The basis is a consistent design process that is adapted to the context of the company. It is used in all corporate functions: The defined standard is implemented in the product development process, as well as utilized in design trainings by Human Resources. Digital toolbox: We developed a toolbox with more than 50 design tools which includes the essentials for every process step. It is available online or in a printed version for all employees. Compliance: How might we increase the awareness and ownership of compliance amongst employees? Security: How might we ensure a convenient and secure access to our buildings and infrastructure? Customer Relationship Management: How might we strengthen the relationship and loyalty between our brand and our customers? Human Resources: How might we ensure an outstanding employee experience during the annual performance review? Marketing: How might we enable an end-to-end experience for our customers over all channels? Product Development: How might we provide an eHealth solution that both decreases the mortality rate in rural Kenya and provides opportunities for growth? Customer Service: How can we improve our Customer Service and save money at the same time? We believe in the power of networks and bottom-up movements. For that reason we host a Practitioners Community, which holds online and offline knowledge, and offers a cross-functional network and exchange. Virtual Community: Our community is followed by more than 550 employees worldwide. On the online campus these practitioners share background information on current projects, utilize methods and tools, and share results. Community day: To gather information we host an annual community day in order to expand personal networks and share knowledge. The world is changing too rapidly to work today with the knowledge from yesterday. Therefore, we foster strong exchanges with players in economics and science to develop knowledge together. Support Research: Together with the Köln International School of Design, we conducted a research project in order to evaluate the status-quo of big companies and their implementation of Design & Innovation Labs. The results are valuable for economics and science and influence the strategic direction of the lab of HR Digital & Innovation today. 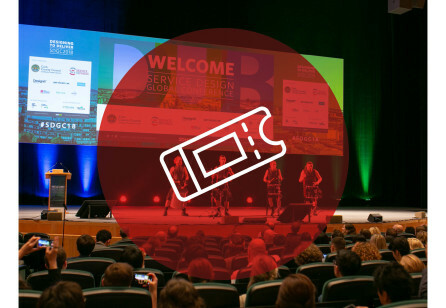 Define Standards: We are a founding partner of the registered organization d.Standards, which aims to define certified qualification standards among design practitioners in the corporate world. We adapt mechanisms from nature: encouraging cell division in order to trigger multiplications. Meaning that we educate coaches in particular divisions and departments and create a local infrastructure (e.g. building Creative Spaces) in order to encourage the use of creative methods. Next to methodological knowledge and the right mind-set, we believe that it is also important to have dedicated spaces. We call those spaces Creative Spaces. Creative Space Guideline: In order to make it easier for our teams worldwide, we produced a comprehensive guide that explains how to develop a creative space step-by-step.